The Chicago Coin Club is a group of collectors interested in all aspects of numismatics. With one exception, we meet monthly in downtown Chicago on the second Wednesday of every month at 6:45 pm. Note the earlier time! You are always welcome to join us and learn with us. Choose any of the following to learn more about us. Or just scroll through and read it all. The Chicago Coin Club was founded in 1919 and has continued uninterrupted for over 90 years. Any person interested in numismatics is eligible for membership. Except for the December banquet, our current downtown meeting space is at the Chicago Bar Association, 321 S. Plymouth Court, 3rd floor meeting room. Plymouth Court is located between State and Dearborn Streets; Plymouth is a short street, going south from Jackson. Please remember the security measures at our meeting building: everyone must show their photo-ID and register at the guard’s desk. In concert with Chicago Coin Club’s 100th anniversary, John Riley will take a close look at old Chicago — the City’s own numismatic history from the bustling industrial age — along with the different individuals and firms who struck trade tokens and medals in the City. He will display many examples of their work and explain how the information age has made the myriad of yesteryear’s products considerably more identifiable and collectible. At the end of our regular April meeting in downtown Chicago, we will recess and reconvene at our CSNS meeting. April 27, 2019 - CCC Meeting - 1PM at the Central States Numismatic Society (CSNS) Convention, which is held at the Renaissance Hotel & Convention Center, 1551 N. Thoreau Drive, Schaumburg, IL. No admission charge for our meeting. Women are beginning to gain an unusual amount of prominence both in the workplace and privately. This new generation of strong women is clearly evident in the modern world, but what about women from antiquity? How are women from the Greek, Roman and Byzantine (or Eastern Roman) periods represented and remembered? I will present how women are represented on coinage and what can be learned about their lives aside from their images. Strong women such as Cleopatra, Livia, Julia Domna, and Irene are remembered, but compared with their male counterparts there is sadly little more than a handful of names that stand out as iconic women from antiquity. I hope to shed light on how women have been represented on coinage and what we can learn about them from coins. Our monthly newsletter is called the Chatter and is mailed to all members at the beginning of each month. Here is the current issue. The 2013, 2014, and 2015 ANA summer conventions were in Chicago — the Stephens Convention Center in Rosemont, to be exact. We were the host club, and we are the host club again when ANA returns to the Stephens Convention Center on August 13-17, 2019. A one-day ANS/CCC Symposium was held on March 27, 1996. The program consisted of ten original papers by outstanding numismatic scholars from the Midwest and the curatorial staff of the American Numismatic Society. A 7 PM dinner was separate from the symposium. All events took place at the Sheraton Chicago Hotel & Towers, 301 E. North Water St., Chicago, on March 27, 1996. This was the headquarters hotel for the Chicago International Coin Fair, held from March 29-31, 1996. We celebrated the club’s 90th Anniversary with medals and a banquet in 2009. The one-thousandth meeting of the Chicago Coin Club was honored with a banquet dinner meeting in April, 2002, held on Saturday night during CICF, at the show's hotel (a new location for 2002). Mark Wieclaw chaired the planning committee. The club hosted the annual summer convention of the American Numismatic Association at the Rosemont Convention Center in a number of years since 1991. They hold their conventions in cities around the country; check their schedule of future conventions, to see if they will be close to you. One of the items honoring the 800th meeting of the Chicago Coin Club, on September 14, 1985, is the book Perspectives in Numismatics. Its 19 manuscripts cover many aspects of numismatics: Sear on Roman Coinage, Lhotka on Medieval European Coinage, Newman on Maryland's Dollar Denominated Paper Money, van Beek on Jetons, and Pearlman on the Hobby are only some. So far, the text from 18 of the manuscripts are avaible online. The illustrations will be brought up from the original artwork where possible, so the illustrations will take some time. 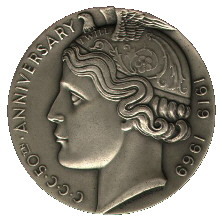 From 1989 through 2011, the club prepared a handout for all attendees at the meeting held in conjunction with the Chicago International Coin Fair, under the general heading of Odd and Curious Money. In 1996, the club started a similar handout for the meeting in conjunction with the Chicago Paper Money Exposition, with each handout looking at a bank from the Chicago area. Although the handout is free to each attendee, extras are available for sale. The club is pleased to host an online numismatic library containing works in HTML to make viewing more flexible and searching possible. Please send comments, questions, and requests to us and include library as part of the subject line. In honor of the centennial of the Chicago Coin Club, the club created a Hall of Fame to recognize some of the prominent numismatists among its ranks over the past century. Twelve inductees form the Inaugural Class, with one member announced each month during 2019. After the inaugural class of twelve has been named, the criteria for future membership shall be developed, along with all of the other tasks in support of this endeavor. Some medals and handouts are still available. See the order form for pricing and availability. To become a member of the Chicago Coin Club you must attend a meeting and fill out and submit an application along with a membership fee of $20 ($10 for Junior membership). A 1st reading of your application will be held at this meeting for membership approval. A 2nd reading will be held at the next monthly meeting, following publication of your name in the club newsletter. Upon membership approval, applicant will become a member. Applicant not required to be present at 2nd reading. Comments and questions are always welcome. These Chicago Coin Club pages are created and maintained by Paul Hybert, with design advice from Mike Metras.